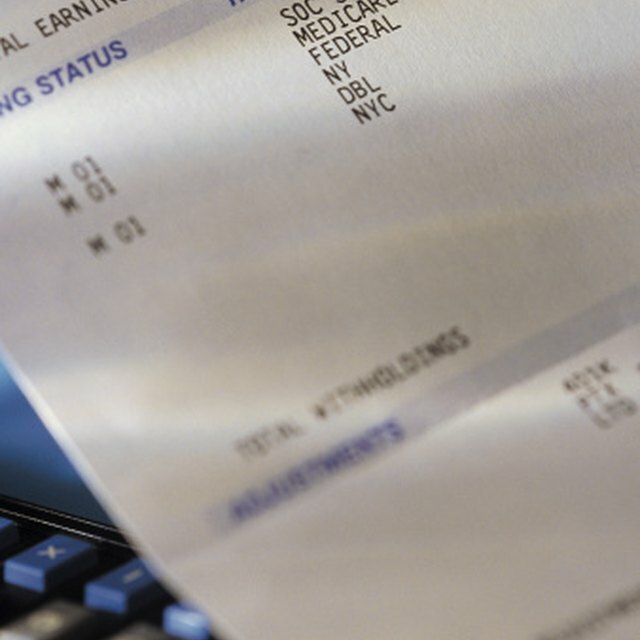 Employers are often required by law to withhold federal income tax, Medicare tax and Social Security tax from employees’ payroll checks. Additionally, all states require state income tax withholding, except for Alaska, Florida, Nevada, New Hampshire, South Dakota, Texas, Tennessee, Washington and Wyoming. As the employer, you must figure each tax based on withholding criteria. Consult the Internal Revenue Service's Circular E withholding tax tables for the appropriate tax year to determine federal income tax. The IRS sends employers an updated copy of the Circular E annually. You can also find it via the IRS website. You also need the employee’s withholding conditions, such as filing status and allowances. You can get this data from his W-4 form. The federal income tax withholding amount depends on the employee’s income, filing status, allowances and the federal withholding tax tables. Suppose that he earns $1,200 semimonthly and claims married with one allowance. The 2010 Circular says you should withhold $50 from each of his semimonthly payroll checks. Calculate Social Security and Medicare withholding. You can find the respective percentages in the Circular E and on the Social Security Administration website. Withhold Social Security tax at 6.2 percent of gross earnings and Medicare tax at 1.45 percent as of 2010. Notably, the Social Security wage cap for the year is $106,800. Do not deduct any more Social Security tax for employees who have satisfied this amount for the year. Start the withholding back up when the new year begins. Social Security example: $1,200 x .062 = $74.40, semimonthly withholding. Medicare example: $1,200 x .0145 = $17.40, semimonthly withholding. Figure out the state income tax. Use the employee’s state withholding allowance certificate and the state withholding tax tables. The rates vary by state, so you must use the tax tables relevant to the employee’s work state. For example, according to the Georgia withholding tax tables, you would withhold $18.06 weekly for an employee who earns $500 a week and claims single with two allowances. If the employee claims &ldquo;exempt&rdquo; on her W-4 or state withholding tax form, do not withhold any federal or state income tax, respectively. Additionally, if her tax form includes a flat amount of tax to be withheld from each paycheck, include it in the withholding amount. If the employee claims “exempt” on her W-4 or state withholding tax form, do not withhold any federal or state income tax, respectively. Additionally, if her tax form includes a flat amount of tax to be withheld from each paycheck, include it in the withholding amount.